Chinese President Xi Jinping held talks in Beijing with Tonga’s King Tupou VI and they agreed to further promote the strategic partnership between China and Tonga. 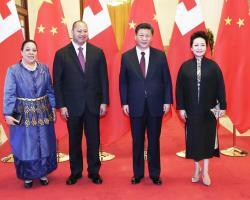 During their talks held in the Great Hall of the People, Xi said King Tupou VI has made historic contribution to China-Tonga ties and he hoped that the royal family of Tonga would continue to play a positive role in the development of bilateral ties. This year marks 20th anniversary of the establishment of China-Tonga diplomatic ties. Tupou VI came to China in the capacity of foreign and defense minister 20 years ago to sign a communique to establish diplomatic relations. Xi said China and the Pacific island countries including Tonga were good friends and partners. “It is put forward at the 19th National Congress of the Communist Party of China (CPC) that China will advance a new form of international relations featuring mutual respect, fairness, justice, and win-win cooperation and a community with a shared future for mankind,” Xi said. He called on both countries to enhance exchanges at all levels and strengthen political mutual trust, continue to support and understand each other on issues concerning sovereignty, territory integrity and national dignity. Xi encouraged the two countries to expand communication and exchanges between government departments and legislature bodies, dig up potential in cooperation in various areas and forge ahead with cooperation under the Belt and Road Initiative. Noting that China knows well the challenges small developing island countries such as Tonga faced with during their economic and social development, Xi said China was willing to continue to provide Tonga with economic and technological assistance within its capability and would never attach any political conditions to such assistance. He said China would fulfill all its promises to let more local people benefit from China-Tonga cooperation. Xi also said that China would like to enhance cooperation with Tonga on climate change and strengthen exchanges with Pacific island countries. Tupou VI, who arrived in Beijing Wednesday for a nine-day state visit, first congratulated the Communist Party of China (CPC) on the successful conclusion of the 19th National Congress. Speaking highly of Xi’s “visionary and talented leadership,” Tupou VI said he believed that China would score even greater achievements under Xi’s leadership. He said Tonga attached great importance to the relationship with China and appreciated China’s support and assistance to the country, especially the assistance provided immediately after it was hit by a recent hurricane. “Tonga agrees with China on its vision to build a new type of international relations and stands ready to work with China to build a community with a shared future for mankind,” the King said. He said Tonga firmly adhered to the one-China policy. Noting that Tonga was willing to enhance cooperation with China in areas including trade, infrastructural construction and under the Belt and Road Initiative, Tupou VI said he hoped China could help Tonga to realize greater development and address the challenges posed by climate change. Tonga supports China in deepening ties with Pacific island countries, he said. After the talks, the two countries signed seven agreements in areas including economic and technological cooperation, human resources and education with the witness of the two heads of state. The two countries issued a joint press communique Thursday. Chinese Premier Li Keqiang also met with King Tupou VI Thursday afternoon in Beijing. Li called on the two countries to consolidate political trust, expand pragmatic cooperation, enhance people-to-people exchanges and integrate the Belt and Road Initiative and Tonga’s development strategy. “China supports the major production projects, infrastructure and projects related to people’s well-being in Tonga,” Li said, adding that “China is willing to have agricultural technology exchanges with Tonga, and the Chinese market also welcomes high-quality agricultural and fishery products from Tonga.” Li also extended his condolences over the tropical cyclone damage in Tonga and reiterated that China would offer as much help as possible. King Tupou VI said Tonga was ready to cooperate more with China in education, infrastructure, agriculture and food to realize win-win results. Besides Beijing, Tupou VI also visit the eastern province of Zhejiang and southern provinces of Hainan and Guangdong during his nine-day stay in China.